In working on getting Remote debugging with VS Code on Windows to a Raspberry Pi using .NET Core on ARM in my last post, I was looking for optimizations and realized that I was using plink/putty for my SSH tunnel. Putty is one of those tools that we (as developers) often take for granted, but ideally I could do stuff like this without installing yet another tool. Being able to use out of the box tools has a lot of value. I could use Linux/bash that's built into Windows 10 for years now. As you may know, Windows 10 can run many Linuxes out of the box. If I have a Linux distro configured, I can call Linux commands locally from CMD or PowerShell. For example, here you see I have three Linuxes and one is the default. I can call "wsl" and any command line is passed in. So theoretically I could "wsl ssh" and use that Linux's ssh, but again, requires setup and it's a little silly. Windows 10 now supports OpenSSL already! Open an admin PowerShell to see if you have it installed. Here I have the client software installed but not the server. You'll get all the standard OpenSSH stuff that one would want. Level set - What are we doing and what are we trying to accomplish? I want to be able to type "ssh pi@crowpi" from my Windows machine and automatically be logged in. Make a key on my Window machine. The FROM. I want to ssh FROM here TO the Linux machine. Tell the Linux machine (by transferring it over) about the public piece of my key and add it to a specific user's allowed_keys. Here's what I did. Note you can do this is several ways. You can gen the key on the Linux side and scp it over, you can use a custom key and give it a filename, you can use a password as you like. Just get the essence right. Below, note that when the command line is C:\ I'm on Windows and when it's $ I'm on the remote Linux machine/Raspberry Pi. I ssh'ed over to Linux and note I'm prompted for a password, as expected. 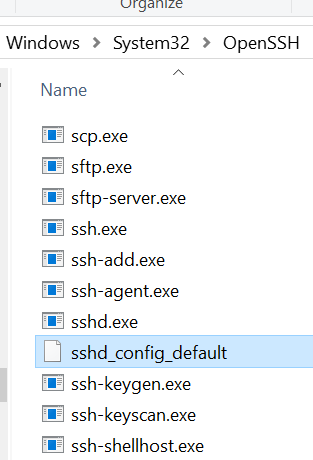 I "ls" to see that I have a .ssh/ folder. Cool. You can see authorized_keys is in there, you may or may no have this file or folder. Make the ~/.ssh folder if you don't. Exit out. I'm in Windows now. Look closely here. I'm "scott" on Windows so my public key is in c:\users\scott\.ssh\id_rsa.pub. Yours could be in a file you named earlier, be conscious. I'm type'ing (cat on Linux is type on Windows) that text file out and piping it into SSH where I login that remote machine with the user pi and I then cat (on the Linux side now) and append >> that text to the .ssh/authorized_keys folder. The ~ folder is implied but could be added if you like. Now when I ssh pi@crowpi I should NOT be prompted for a password. Your identification has been saved in C:\Users\scott/.ssh/id_rsa. Your public key has been saved in C:\Users\scott/.ssh/id_rsa.pub. Fab. At this point I could go BACK to my Windows' Visual Studio Code launch.json and simplify it to NOT use Plink/Putty and just use ssh and the ssh key management that's included with Windows. NOTE: In my previous blog post some folks noted I am logging in as "root." That's an artifact of the way that .NET Core is accessing the GPIO pins. That won't be like that forever. Thoughts? I hope this helps someone. Don't mess around creating the .ssh folder on the remote machine by hand. Use ssh-copy-id from your desktop instead, it does everything for you, and you can rely on the same syntax whether you're SSHing from Windows or Linux. It's a little shameless plug, but it's relevant. I recently wrote about how I ssh'd into GitHub (as I'd never done that before). It also contains the pitfalls I fell into when creating my first keys. May not have done the best job, but it's the first time I did that. If you have to create the .ssh directory and authorized_keys file, make sure to set the right permissions. The permissions are important! It won't work without the right permissions! ...just blew my mind. That's some next-level SSHing right there! ...and just like that I can now SSH all over my home network with nary a password prompt. Also, the Ubiquiti UniFi cloud key lets you paste in the contents of your public key file in the config, and it takes care of provisioning it out to all of its managed network devices for you.